Learning without thought is labor lost. 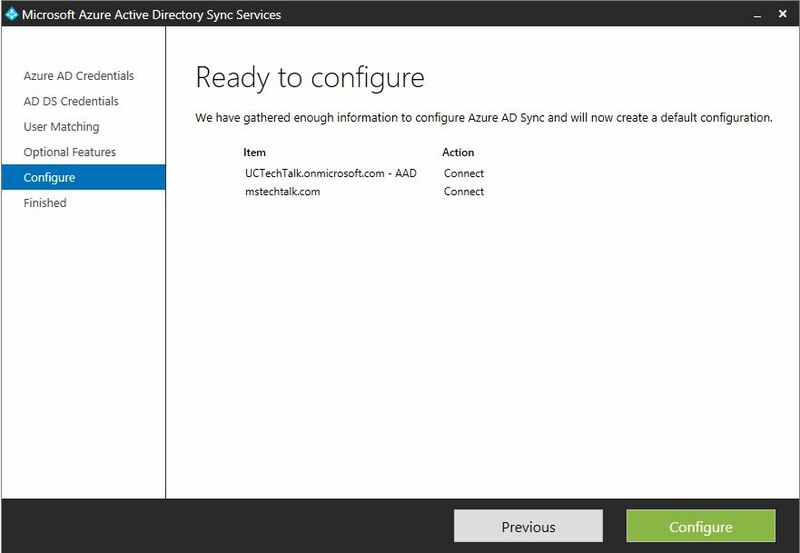 In this article we will install and configure the Azure AD Sync tool to synchronize on prem identities with office 365. 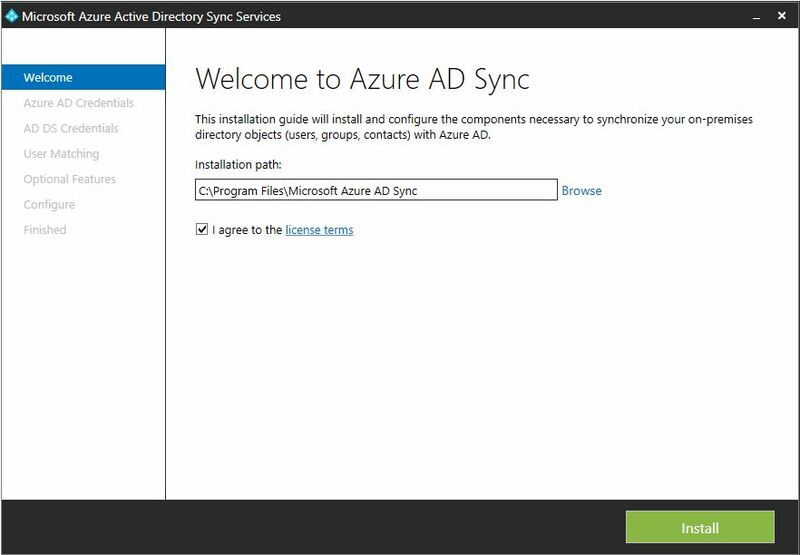 Part 1 of this article series revolves around the prerequisites required to install and configure Azure AD Sync tool. 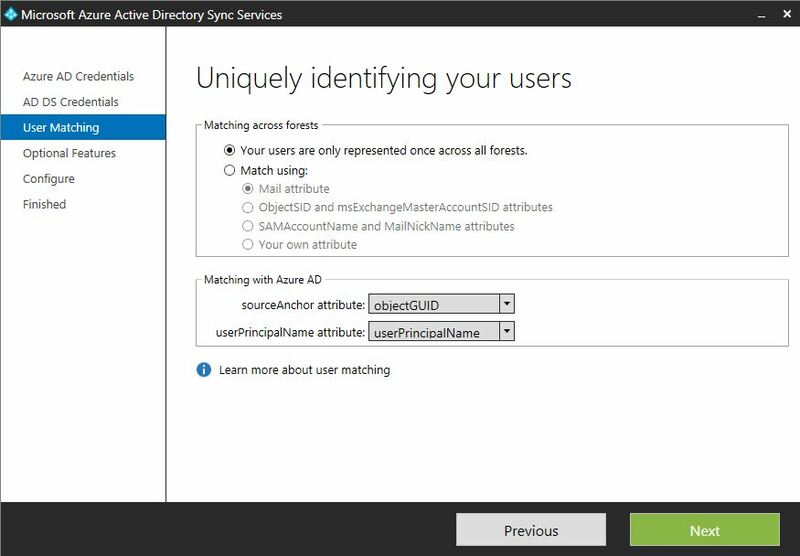 We’re already done with Azure AD Sync tool prerequisites and has created the required service account on Office 365 and on prem active directory. Let’s get started with Part 2 of this series. 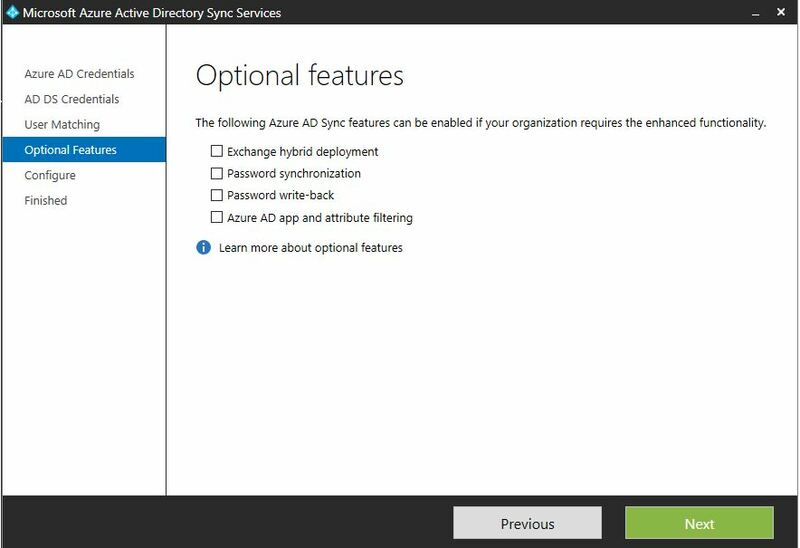 You can download the most recent version of Azure AD Sync using the following link of Microsoft Website. If there are 100,000 or less objects in AD to sync to Office 365 you can use SQL express, If more objects are needed then a full version of SQL is required. The minimum recommended hardware requirements for the synchronization server in relation to how many objects you have in your on-premises Active Directory can be found on Technet. 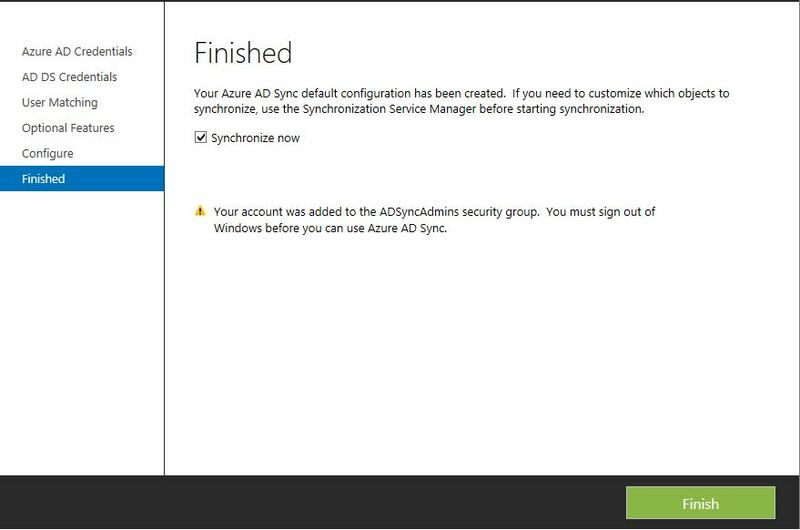 It’s recommended that you should use a separate machine for Azure AD Sync tool installation. 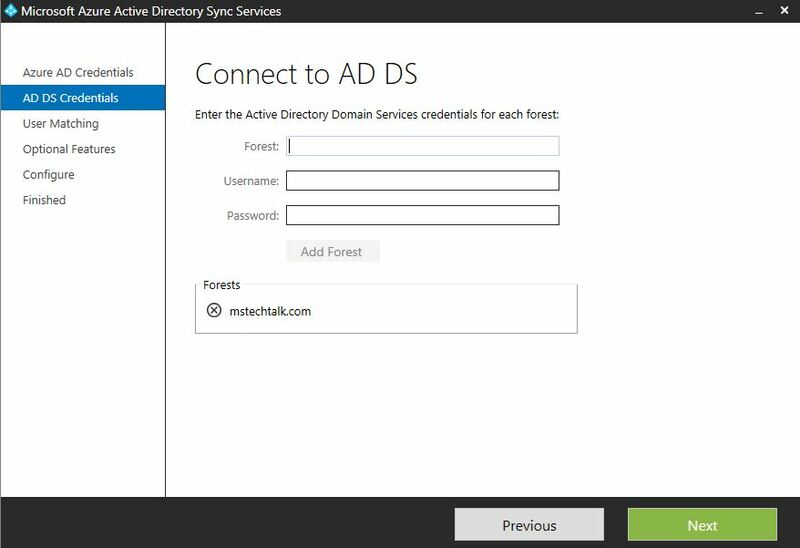 Azure AD Sync tool should not be installed and configured on Domain Controller and ADFS server as it’s not recommended. 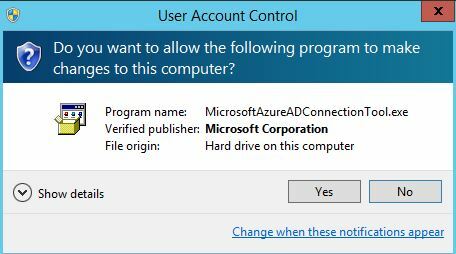 Once you run the executable, Click YES on User Account Control pop up to start the process. 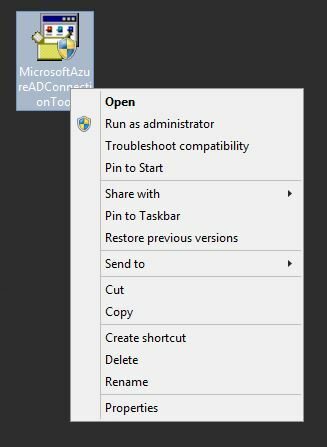 Windows Azure AD Sync setup will being, specify the path to install the tool. In our case, we’re using the default installation path. 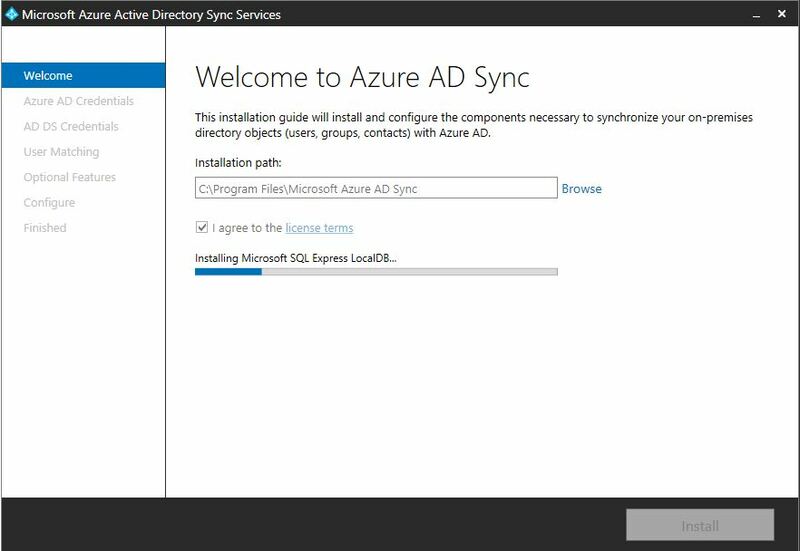 Once you click on install, Azure AD Sync will start installing components like SQL Express, Connectors etc. After the installation of required components is completed, you’ll be prompted for below screen to provide your Azure AD Credentials. This needs to be your office 365 Global Admin credentials. We’re using AzureAD@UCTechTalk.onmicrosoft.com as a service account created in part 1 of this series. After connecting with Office 365 using Global Admin Credentials, the next screen will be presented to enter your on prem active directory account credentials. 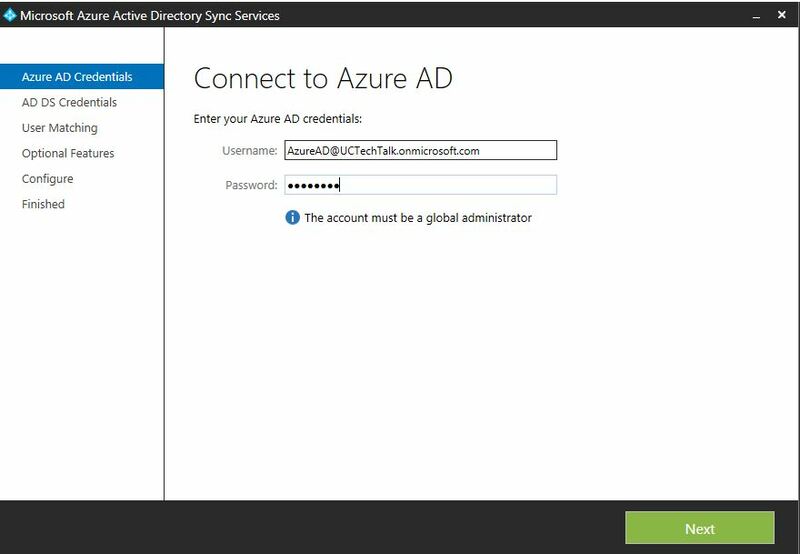 In our case, We’ve already setup a service account in our local active directory and we will use the same account here as shown below. 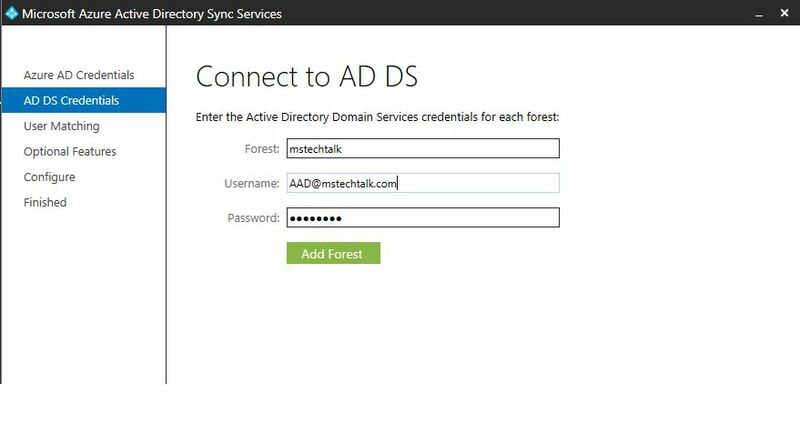 After providing the credentials, click on Add Forest and Active Directory forest will be added as shown below. Repeat the same steps to add multiple forests. Next Screen will be presented for User Matching, You can uniquely identify your users based on criteria defined here. We’re using the default settings. Next screen will be presented to choose the Optional Features and the new features that comes with Azure AD Sync tool. Once the configuration is completed, Click on Finish and the Wizard begins the process of synchronizing on prem identities with Office 365. To verify that the users have been synchronized with Office 365, login to Office 365 –> Users –> Active Users and verify the last sync time and Status. By Default, Azure AD Sync tool Synchronized with office 365 after every 3 Hours. We can change this time at any time. Riaz is a technology evangelist with over 8 years of extensive experience with expertise on Identity Management, Exchange Server, Office 365 and a bit of System Center. 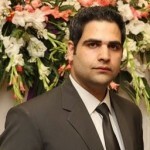 Riaz is currently working as Lead Consultant. His technical experience is followed by 8 years consulting positions advising both internal and external (local & International) stakeholders/customers on strategic technology selection and adoption along with delivery of solutions across a range of business units. He is a regional lead speaker for Microsoft Office 365 and also speaks in community forums.